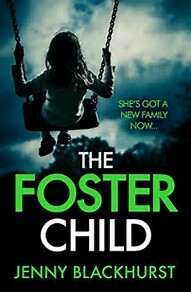 The Foster Child is the first book I have come across by author Jenny Blackhurst but after reading the synopsis for this book I couldn't wait to get stuck in and see what havoc this dangerous little girl was going to create in this book. Imogen has clearly has something bad happen in her career recently which has resulted to her moving back to her childhood town on Gaunt but her past is kept hidden from us throughout the majority of the book which adds to the suspense. When she starts her new job she meets 11 year old Ellie who is having a tough time adjusting at her new school and her new foster home, branded a little witch Imogen is horrified at the way both children and adults have been treating her and is shocked at the things they are accusing her of doing. As more events unfold including a murder, Imogen can't help but begin to question is there any truth in the accusations or is she just as bad as the rest of them? This really is one of those books that keeps you guessing the whole way through. At times I found the storyline absolutely ridiculous only to then start questioning myself, it really did play mind tricks on me right up until the last page. I loved the eerie and mysterious feel that the author managed to create I hold my hands up and say I didn't predict at all what the outcome would be I only began to get suspicious of one character around three quarters of the way through the book so I was in suspense throughout the majority of the book. Ellie really was a peculiar child and she is certainly not a character that you would warm too even after finding out about her devastating background. I also found that I couldn't warm to Imogen but again I think this was because there was constant speculation about her background and how it may be impacting her dealings with Ellie I just didn't feel like I could trust her and was almost waiting for something to be revealed. With Halloween around the corner I think this is the perfect eerie read with a creepy little character who you never quite know what will happen around her next. Full of suspense and keeping you on your guard you can't go wrong with this book.